On a day when Tiger Woods showed signs of life with a closing 66, the Dubliner brilliantly moved to within two shots of the lead when he fired a 197-yard seven iron to just 15 feet at the first and holed the eagle putt. 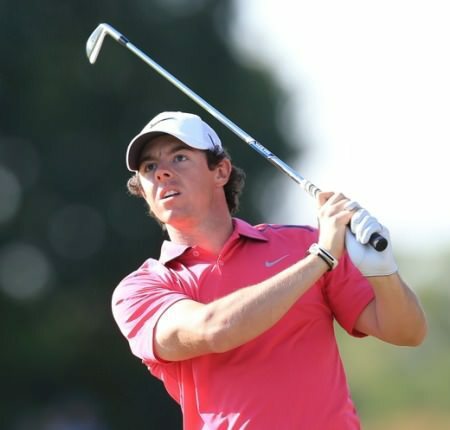 But the triple major winner was reduced to the role of also ran just two holes later when he racked up a triple bogey seven at the tough third hole and eventually carded a 73 to finish in a five way tied for tenth place with the likes of Woods and Rory McIlroy (74) on eight under par. The Dubliner found the lake off right of the third with his tee shot and found water again with his third after his attempted 230-yard five wood came up short. Forced to take another penalty drop, his fifth shot airmailed the green and he did well in the end just to drop three shots as he holed a slippery 15 footer for his seven. But he insisted he had no regrets about his decision to go for the green with his third and declared himself happy with his game as he prepared to continue his countdown to the Masters at this week’s Transitions Championship in Tampa. “At the end of the day I was forced into taking on the shot,” Harrington said of his third over water. “Such is life. It is disappointing obviously. “It is just one of those things. At times you are going to get some tough shots. But I very happy leaving this tournament. “I had 213 yards to the front and hit a beautiful third shot with a five wood straight at the middle of the green but it came out spinney out of the rough. Harrington was unlucky that he was forced to drop at the beginning of the lake rather than 80 yard further forward. Watney birdied the last from 13 feet for a five under par 67 that gave him a two-shot win over Johnson on 16 under par with Dane Anders Hansen (67) and Italy’s Francesco Molinari (69) tied for third on 12 under par. But it was a day to forget for McIlroy, who had a poor day with the driver and the putter as he mixed two birdies and four bogeys in a 74 that left him in a five-way tie for 10th worth a cool $129,000. The top names are simply fine-tuning their games for the Masters in just over three weeks time and while Graeme McDowell closed with a 75 that left him tied for 42nd on one-over par, he was upbeat about the state of his game and feeling good about his build-up to Augusta. “It was a frustrating week overall,” said McDowell, who also fell victim to the third where he took a double bogey six. “I didn’t keep the ball in play often enough and made too many mistakes with my long game. Reigning Masters champion Phil Mickelson visited 14 bunkers as he closed with a 76 to finish tied 55th on four over. But Woods was upbeat about his game after a 66 featuring seven birdies and just one dropped shot.